We all know how prolonged sitting periods affect our health. With the changing work environment, working hours can increase to up to 60 hours a week or even more in the world of investment banking. We have often thought of including exercising into our daily schedules but it mostly falls off when we become too busy. But have you thought of working when exercising? That’s where a treadmill desk comes in. 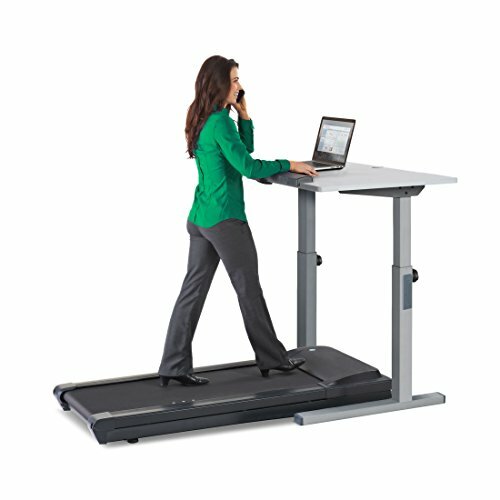 Well, with a treadmill desk, you can achieve a work-exercise balance with less hassle and without having to give up one for the other. 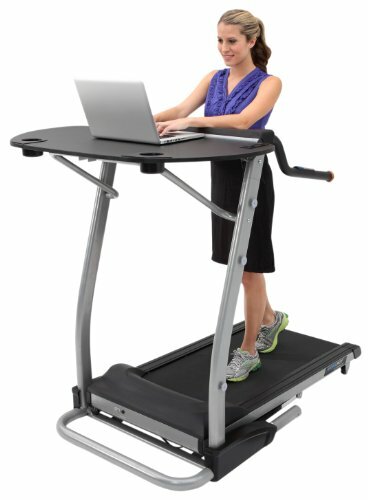 So What Are Some Of The Benefits Of A Treadmill Desk? 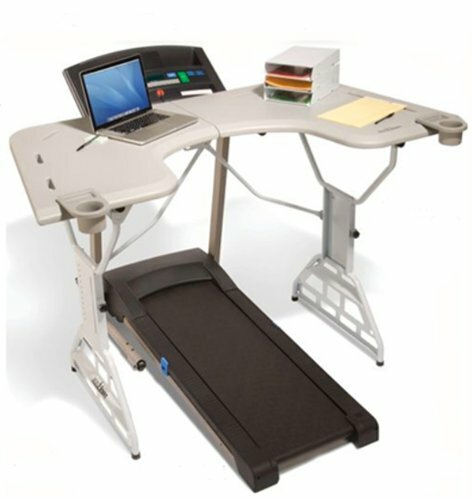 Get a treadmill desk that offers you the comfort you need while walking without compromising on your workstation space. This will depend on how much room you have in working space. While we might want a lightweight treadmill since they are easier to move around, they are not as solid and well-built as heavier treadmills are. Consider a treadmill that requires minimal to no assembling at all. You should also ensure this is something you can do by yourself. 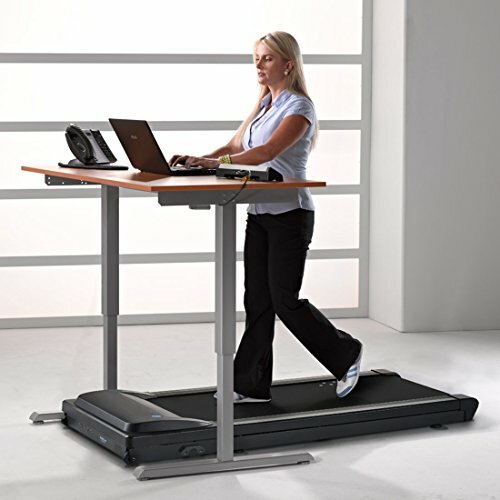 Choose a treadmill desk that will allow you to walk without disturbing those around you. Most treadmill desks are designed in a way that they won’t be a distraction. But if you work alone, you have more freedom. 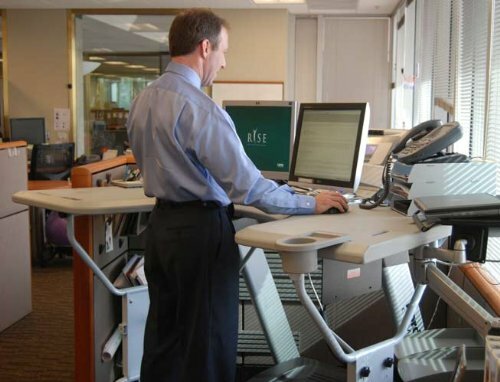 The desk should allow you to walk at your preferred pace. Some treadmills offer speeds of up to 4 mph but a maximum speed setting of 2 mph is usually recommended for safety. Consider a treadmill with a large enough motor to support your activity but with minimal motor noise during operation. The size of the belt is extremely important, and the belt dimension should be selected based on the user’s size and length of stride. Some treadmills come with a desk already attached while others have special desks that will fit over them. Treadmills with attached desks are more stable. If not attached, ensure the desk is separate from the treadmill to prevent the transfer of vibrations to the desktop surface. A connectivity panel will allow you to power your devices while exercising. This is most important if you consider working on the treadmill for longer periods of time. Different treadmills have varying maximum recommended user weight. Always keep this in mind before getting one. A height adjustable desk means it can fit users of different heights. Some have low height range to allow the desk to be converted to a sitting desk when not using the treadmill. Includes separate coverage for parts, labor and, frame. Consider a treadmill desk with a long (at least 1 year or more) warranty period in case something goes wrong with it. The LifeSpan TR1200-DT5 treadmill desk combines LifeSpan’s Under Desk Treadmill with a standing desk that is height adjustable. Its height adjusts with spring pins to comfortably fit users of heights between 4’10” and 6’8”. 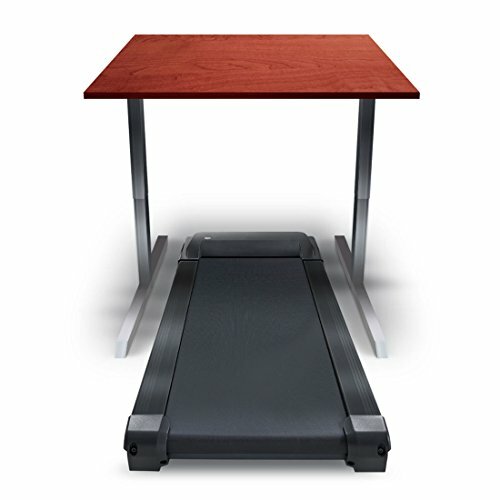 The LifeSpan TR1200-DT5 treadmill desk comes with a 2.25 horsepower continuous duty motor. You can use the treadmill at your workplace or at home without disturbing those around you thanks to the whisper-quiet motor and the 6 point impact absorbing shocks that help minimize the sound on your steps. Its desktop measures 38-inch wide and 29-inch deep to give you enough working area and room for other office supplies. It is not attached directly to the treadmill hence stable during use. The armrest is firm and padded with a console conveniently located at its center which displays time, steps, calories burned, distance covered and speed. You can set your preferred speed between 2 and 3 mph. The belt is 20” wide and 50” long giving you more than enough space. 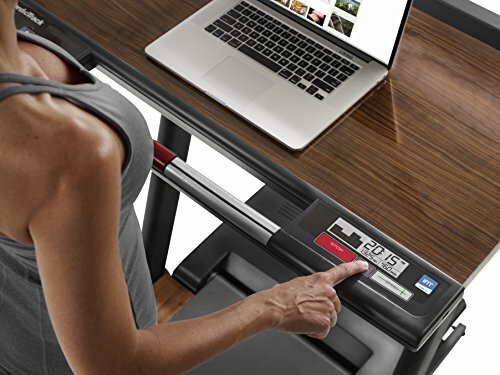 Additional features that come with the LifeSpan TR1200-DT5 treadmill desk include the Bluetooth technology that will allow you to connect the treadmill to your devices to track your walking progress. Its step technology will ensure each step you take is detected for an accurate daily step count. It also has an integrated safety feature that comprises a safety clip that stops the treadmill when you are not actively walking. The 2 wheels on the front of the treadmill will make it easy to move. Its cable management will ensure no power cords litter your work area. 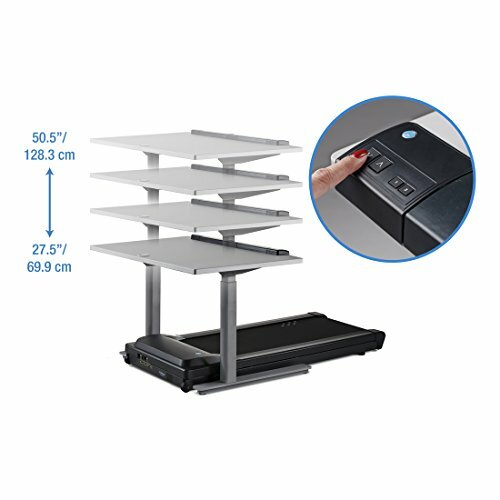 The LifeSpan TR1200-DT7 treadmill desk can be adjusted with a touch from 40” to 53” thus can be used by users of different heights. 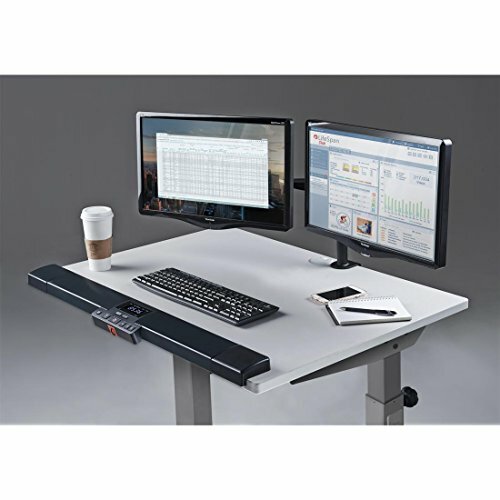 The desktop has width options from 38” to 72” to enable you to customize your desk for both small working areas and when you want a bigger working surface. The whisper-quiet 2.25 HP motor coupled with 6-point impact absorbing shock lessens noise while using the treadmill keeping both you and your colleagues focused on work. The 38” wide and 29” deep desktop will give you an ample working space for most office supplies you may need. It has a padded armrest for your comfort and balance. The armrest has a 5-digit console at the center that is easy to read. The step technology will ensure no step you take is missed for an accurate daily step count. The Intelli-guard safety feature guarantees safety as the treadmill will only operate when you are actively walking. You can sync your data to your phone effortlessly to keep track of your activity progress thanks to the Bluetooth technology. Its low height range allows the LifeSpan TR1200-DT7 treadmill desk to be transformed easily to a seated desk by just placing a stool on the treadmill. It is backed by a lifetime warranty for the frame, a 3-year motor warranty, and 1-year labor warranty. As the name suggests, LifeSpan TR1200-DT3 is designed to fit under your standing desk. 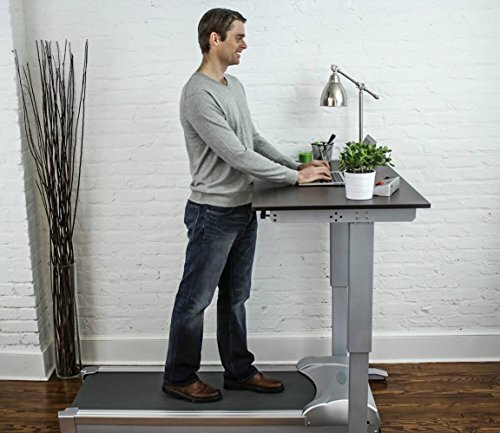 This means you can transform your standing work desk into a walking treadmill desk. It also gives you the freedom to choose which working desk you want to use. Its whisper-quiet 2.25 HP motor will ensure quiet operation without disturbing other people around your work area. Its speed can be set from 2 to 4 mph. It features 6 compression shock absorbers which reduce ankle and feet joint swelling, sore, strain or pains. Its high-quality components and solid construction reduce mechanical noise and vibrations ensuring you concentrate on your work. The LifeSpan TR1200-DT3 treadmill comes with a portable console that sits on your desk without taking up your work area. It reads calories burned, distance traveled, step count, walk and run time. The console has a safety key that shuts down the treadmill once removed. When it comes to technology advancement, the LifeSpan TR1200-DT3 has onboard intelli-step technology that will ensure each step you take is detected for an accurate daily step count. It also has a safety system that ensures the treadmill only works when you are actively walking. You can also sync data via Bluetooth to your mobile phone. The treadmill is small and compact with portable wheels saving on space and storage. You will also love the USB charging port located at the back of the console that will allow you to charge your devices. The LifeSpan TR5000-DT3 comes fully assembled and will fit under most standing desks allowing you to transform your desktop to a treadmill desk. Its base is made of an extra-thick belt that is durable and requires little maintenance. The heavy duty 3 HP motor ensures years of use without breakdowns. The high-quality components suppress mechanical noise and vibrations from the treadmill to keep you focused on your work. It also has 6-impact reducing shocks to protect your feet, hips, back and ankles from pain and strain. The console is portable and will sit on your desktop without taking up your working area. It comes with 2 front wheels making it easy to move. 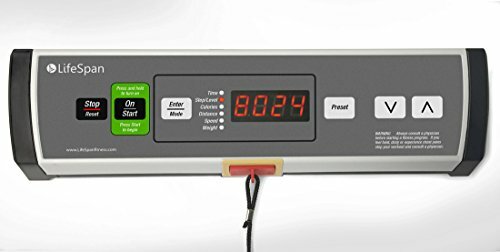 Its LED display shows calories burned, steps taken, distance traveled, and walking speed. It has a safety key that will shut down the treadmill when removed from the console. Additional features of the LifeSpan TR5000-DT3 include the Intelli-step technology that ensures no step taken is missed- this updates you of your daily step count. The Intelli-Guard safety feature ensures the treadmill only operate when you’re actively walking. You will also love the USB port on the console that allows you to charge your devices while walking. The Rebel Treadmill comes fully assembled and is easy to set up. With the help of the front wheels, all you need to do is roll it to the desired place then hit the start button and begin your workout. 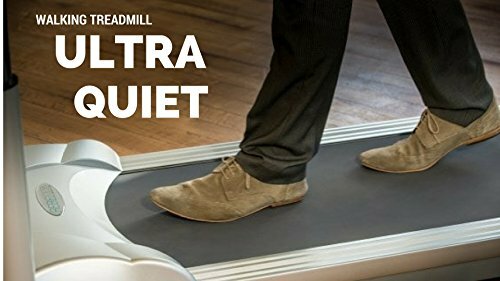 The base of this treadmill has an ultra-quiet motor to ensure you do not disturb those around you. The console has easy to use buttons and will retain your stats for up to 20 minutes after you stop walking. The console also allows you to switch the sound on and off. The speed of the treadmill is between 0.5 to 2 mph which ensures a comfortable walking speed that is less sweaty. In addition, the compact design of Rebel Treadmill 1000 treadmill will ensure it fits in small spaces. The metallic and strong rubber material on the frame ensures durability. To add to this is the 2 ply belt that requires little maintenance. It also has a 20-year warranty on the frame, 2 years for the motor and 1 year for parts and labor. The Titan Fitness under desk treadmill is designed to allow you to select the desk you want to work on and can also fit in small space. Its console is small and will fit on your desktop without taking up much space. The console has a safety key which will stop the treadmill when disconnected. The treadmill offers speeds of between 0 to 4 mph thus you can set your preferred speed. The variable belt speeds make this a unique treadmill. The speed can be set in half mph increments allowing you to control the intensity of your work out as you desire. It has a wide track offering you generous walking space. The treadmill supports up to 250 pounds and has belt dimensions of 53 by 18 inches making it a good choice for people with longer strides. 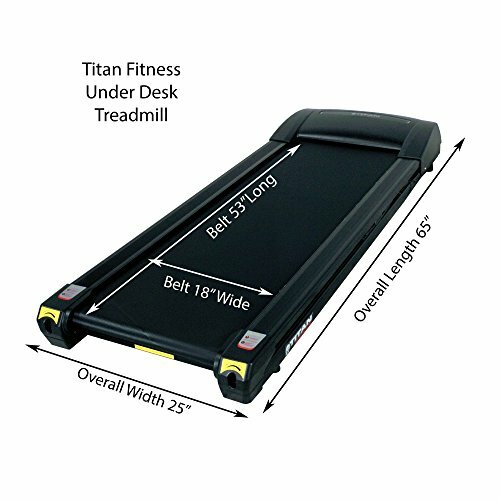 Additional features in Titan Fitness under desk treadmill include the 2 wheels at the front that will allow you to move the machine easily to your preferred area. When it comes to storage the treadmill takes up little floor space when upright or can be folded against a wall. 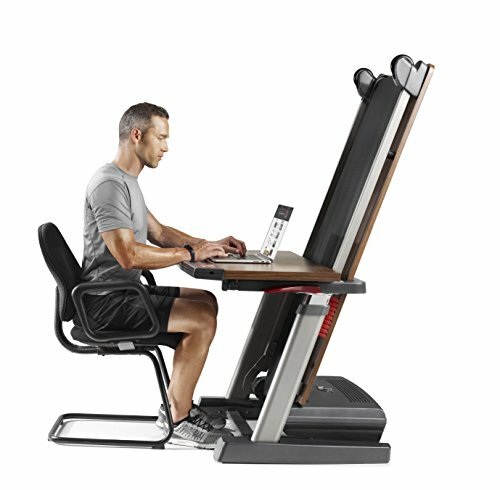 The Trekdesk has been designed to fit most treadmills. The 72 inches long and 34 inches wide desktop offers a generous workspace. It also includes convenient accessories such as three leveled file holders, two cup holders, manuscript holders and a top stand for your phone. The center of the desk has a cutout design to ensure you are close enough to your working station for comfort and to keep all your utilities within easy reach. The desk has two height adjustable supports that are sturdy and durable thanks to the powder-coated steel frame. The desktop adjusts to fit heights of between 5 feet 4 inches and 6 feet 4 inches. The Trekdesk is easy to fold and unfold to transport to a different location or to store away when not in use. It can easily be assembled in about 30 minutes. In addition, the desktop has been designed to be stain resistant with grey/silver support base, accessories, and hardware. The Exerpeutic 2000 Workfit treadmill desk offers a 48-inch by 24-inch desktop that is large enough to hold your office supplies and can hold up to 80 pounds. It has 2 cup holders and pre-drilled cord holes for your convenience. The Exerpeutic 2000 Workfit treadmill has a full-length arm with wrist support that is made of polyurethane foam for comfort. The arms can be adjusted to different angles adding to the comfort. It comes with a quiet 1.5 HP motor for intense walking while ensuring those around you are not disturbed while you are walking. The motor also provides a speed of up to 4 mph with an incline adjustment from 0 to 15%. The backlit computer LCD display reads time, distance covered, calories burned, heart rate and speed. 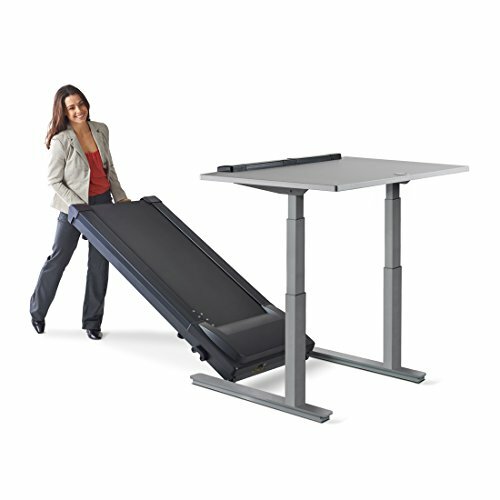 In addition, the desktop and treadmill base folds when not in use for storage. You will love the metal stand that is compatible with iPad and other tablets. 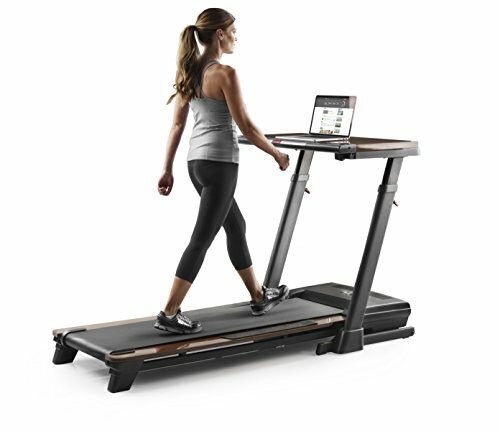 When it comes to safety, the walking surface is non-slip and the treadmill desk also has extra-long safety handles for balance. The handlebars also control the belt speed and incline levels. You can use the pulse sensor pads to measure your heart rate. It has a 3” LCD display at the bottom corner of the treadmill desk on the right hand with a speed adjustment button next to it. It displays calories, distance covered, speed and time. The treadmill offers a walking area of 20” by 55” giving you more space to work out. The track has 2 layers that ensure low maintenance and quiet performance. Its height can be adjusted easily using a knob located along the front of the desk. The whisper quiet 2.6 HP continuous duty motor ensures you can work out with no breakdowns. The motor has a lifetime warranty so you won’t have to worry in case something goes wrong. 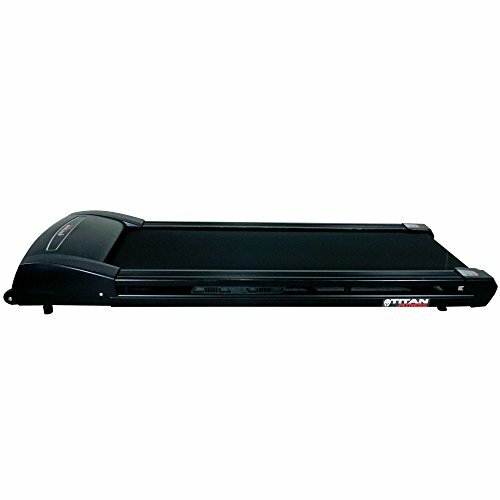 NordicTrack Desk Treadmill has a speed range of 0.5 to 6 mph that will allow you to jog on the treadmill. The cushioned deck will ensure the landing on the treadmill is gentle to your feet. Additional features include a lifetime warranty for the frame and motor and 1-year parts and labor warranty. It also has a USB charging port for your devices while on the treadmill and a heart rate monitor. It can connect to iFit App that will enable you to store workout data, receive coaching among other things. The NordicTrack Desk Platinum treadmill comes with an 18-inch by 40-inch work surface. The desk adjusts between 26 and 42 inches to fit different heights. Its speed ranges from 0 to 8 mph making it convenient for you to step up your work out speed. The 3 HP continuous duty motor will ensure you keep going without a breakdown. The motor is also quiet ensuring you do not disturb those around you while on the treadmill. 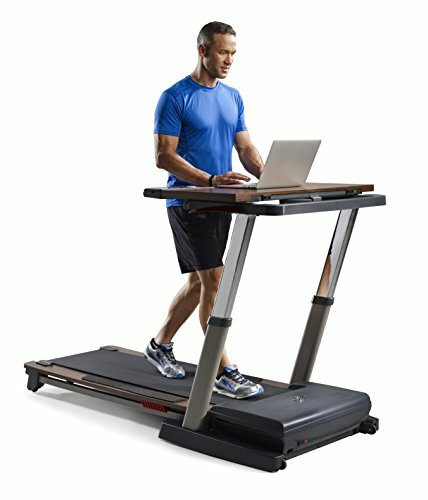 The treadmill desk can be inclined up to 10% which will burn more calories compared to walking on a level surface outdoors. It has a computer LCD display to the right of the desktop to show your incline, calories, speed, distance and time. It can connect to iFit App that will enable you to store workout data, receive coaching among other things. The treadmill has 2.5-inch rollers which ensure your treadmill lasts longer by reducing wear and tear on the drive system. 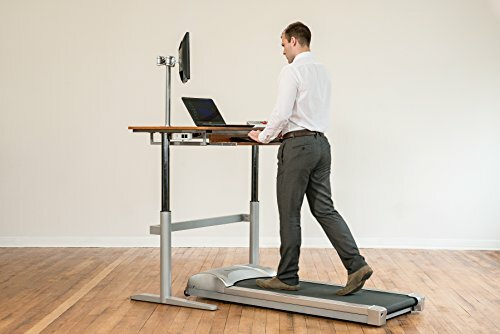 When you are done walking but still want to keep working, the NordiTrack treadmill desk doubles up as a regular desk by lowering the desktop and folding the belt. Other additional features of NordicTrack Desk Platinum treadmill desk include the USB charging station for your devices while working out, the heart rate monitor and the cushioned walking surface. You will also appreciate the lifetime frame and motor warranty, a 2-year parts warranty and, 1-year labor warranty. In the treadmill desk reviews above, we have covered our 10 best treadmills with awesome features to make it easy for you to choose one. Work while exercising for a fun and productive experience. 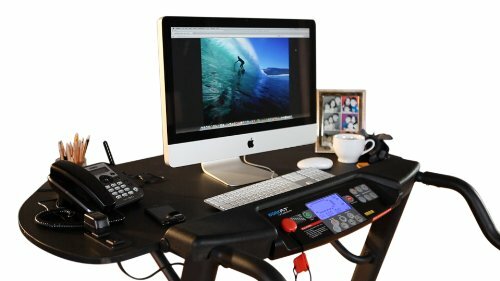 Whatever your budget and particular preferences you can find a desk treadmill that will be the perfect fit.